The Second International Conference on the Peaceful Uses of Atomic Energy was held at the Palais des Nations in Geneva, September 1-13, 1958. Scientific exhibits were shown in a building specially erected in the Palais grounds. 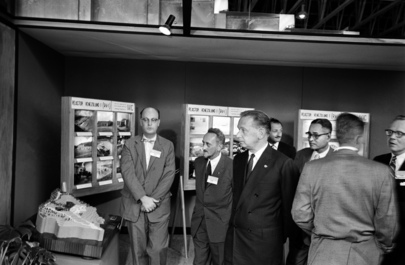 Prof. F. Perrin (France), President of the Conference, and UN Secretary-General Dag Hammarskjöld visit the exhibit of Venezuela, accompanied by Dr. Ralph Bunche (right).